DXARTS 490A (Data-Driven Art) will be offered Autumn quarter 2017 and is open to non-DXARTS students. DXARTS 490A does not count as VLPA credit, but can be used as Elective credit (3 credits). The class is offered on Wednesdays from 11:30am-2:20pm, in 221 Raitt Hall. 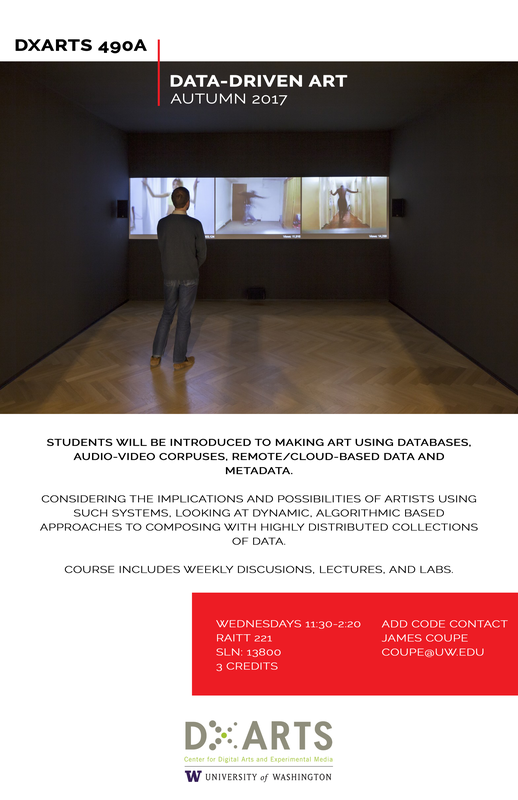 Students will be introduced to making art using databases, audio-video corpses, remote cloud-based data and metadata. Students will consider the implications and possibilities of artists using such systems, looking at dynamic, algorithmic based approaches to composing with highly distributed collections of data. The course includes weekly discussions, lectures, and labs.